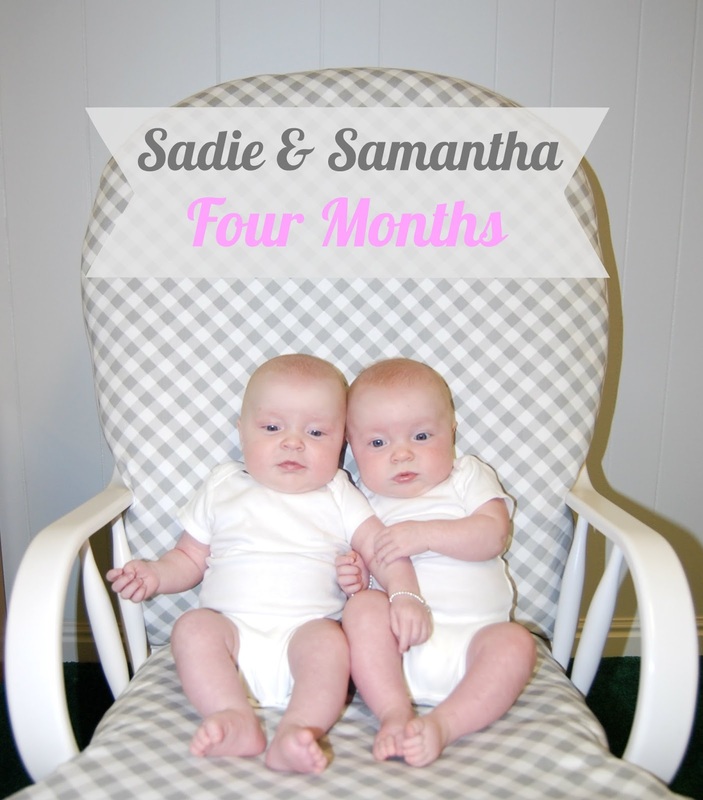 Earlier this month Samantha and Sadie started recognizing each other. Up until now they haven't really looked at each other but now I will catch them watching each other and smiling. It is really sweet. In the sun we can see a little bit of red in both the girls hair. I am excited to see what color of hair the girls will have, when it finally grows in. Both girls have rolled a few times but Sadie really wants to roll and every time I put her on her back on the floor she starts twisting and tries to roll over. Sammy loves sucking on her fingers. She is also starting to get a little dimple on one of her cheeks. Both girls sleep 8 and a half to 9 and a half hours each night. Occasionally I will have to put a binkie back in someone's mouth or re-wrap (yes I am still trying to swaddle the girls, they sleep so much better this way) one of them. It has been a lot of hard work getting them to sleep this much but it is worth all the work. They have become easy to put to bed at night and usually go down with out crying. Time is just flying by with these two girls. They seem so big to me, maybe it's just those chubby cheeks. Cute! They are looking so chubby.